Ford vans have always been good sellers, and the Transit will no doubt do the same. With the cargo versions starting off at $32,285 and the passenger version at $35,005, it’s not going to hurt the pocket too much, which is great for small business or one-man concerns. Having a choice between a normally aspirated 3.7-liter V6 and a twin-turbocharged 3.5-liter EcoBoost for the gasoline fans and a strong and efficient 3.2-liter Powerstroke turbo diesel for fans of that fuel supply means there will be a configuration for most needs. Seating can be for up to 15 people and cargo space is expansive enough to fit a full load of supplied for just about any industry. When you’re looking for a vehicle for company or personal use that’s going to be used to transport things, then something called a Transit seems like a pretty good option. 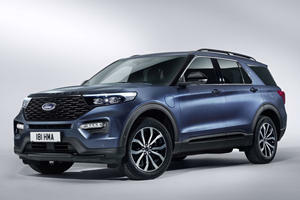 Ford had been a top choice for vehicles of this type for years even though it was starting to look dated, but when this latest version was released with a more European look and feel it reaffirmed itself as a market leader. Also the fact that you can buy a Transit in a host of configurations helps, you can even have some versions without a body, not that it will save you any money though. 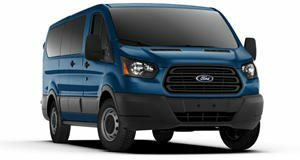 The Ford Transit passenger wagon starts off at $35,005 and the Cargo at $32,285 with a few engine and weight rating options and two wheelbase lengths. Inside the Ford Transit things can be comfortable and smooth, or rather bare and ready to take a load or whatever it is your company deals in. With varying lengths and roof heights the cargo capacities vary too, but know that there is something for just about any use. If you’re moving people, it can be had with seating for 8, 10, 12 or 15 and even at the max number things won’t be too cramped. Because of the foot traffic or rubble, there’s a durable vinyl floor that’s easy to clean. In either way, there’s a good ergonomic dashboard with the infotainment at center stage, a multifunction steering wheel just in front of a gauge cluster that also includes a driver information display. With a fully adjustable seat and telescopic steering, big mirrors and driver aids, a great driving position is available. The configurable rear seating is comfortable with durable materials used too although the front two offer a lot more, and the overall combination is a best-in-class interior. Driving a van like the Ford Transit isn’t ever going to be about being fast with great handling, but it does need to be solid and stable enough to carry a load of passengers in safety. All three engines on offer are good and provide enough power and torque to make for a smooth ride, and the driver aids help this along. Cornering at pace sees a fair amount of body roll, which is a result of giving the van softer suspension to make for a comfortable ride when loaded with humans. The body also sees movement when hit with a side wind, as you can expect from such a large slab flat surface, so some care needs to be taken on the highway, and especially after passing a bigger truck or van. Depending on which length is taken, the Transit can be quite a pain to try and park; luckily the rear-view camera is an option. The Ford Transit range is available with a choice of three engine configurations, with the standard 3.7-liter V6 is available with 275 hp and 260 lb-ft of torque with an available CNG/Propane Gaseous Engine Prep Package for a power conversion to run on compressed natural gas. 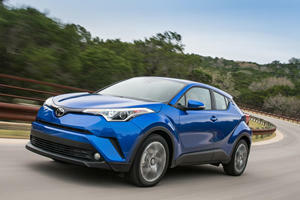 The turbo diesel option is more powerful with 350 lb-ft of torque on tap, which is good for the 3.2-liter capacity. This 185 hp engine is also bio diesel capable if the environment is important to you. 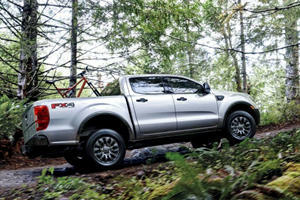 The next step up in the gasoline-fed engines is the twin-turbocharged 3.5-liter V6 that bears the EcoBoost badge. This one is a lot stronger at 310 hp and 400 lb-ft of torque, which is clearly suited to bigger loads and more people being on board. A 6-speed automatic transmission is what you get with a Transit, and a selection of rear axle ratios are available to make things work better for different hauling loads. Carrying cargo is important but there aren’t many safety items available to make sure cargo is safe. There are various options to make sure the cargo stays in place though. When the Ford Transit is meant to carry people, safety becomes a little more meaningful. On the seats you find 3-point safety belts on all seats for all occupants. The drivers are treated to airbags in the usual positions, but for the rear passengers there’s a safety canopy system, which is a full-length, side-curtain airbag that will do a good job of protecting from a side impact. There’s also lane keep assist along with a side-wind stabilization feature that applies the brakes on one side of the vehicle to reduce the effect of a sudden side wind gust when driving. There’s a reason the Ford Transit is a leader in the market. The van ticks all the right boxes in terms of functionality, no matter if you want a cruiser that will get the little league team to the field or to get all of your plumbing goods to a job site. Pricing is on point too with it starting off at $35,000, which is affordable enough for a full fleet or for a small business startup. Basically, it doesn’t look like you can go wrong with a Transit. It all started as a rumor. The country, not the delicious bird.